This was published as a Wall Street Journal Think Tank column on September 10, 2014. 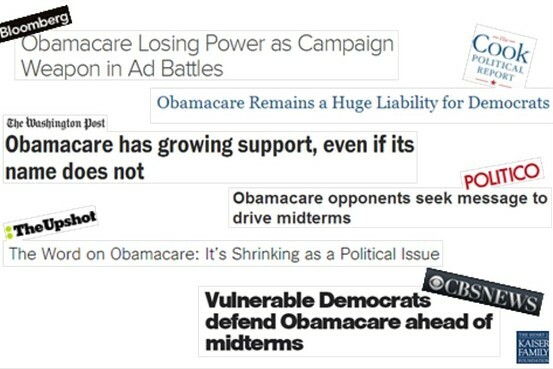 As the image above shows, reporters and pundits–including some of the most respected ones I know–have different takes on the importance of Obamacare as an election issue now that implementation of the law is moving forward and some of the controversy around it has cooled. Observers are split: Some emphasize the law’s decline as a hot political issue, others its staying power as a rallying cry for the right, and a few suggest that the ACA may emerge as an issue Democrats want to run on. Each of these positions may be at least partly right. Obamacare has cooled as an issue now that there isn’t an obvious controversy, such as last fall’s website debacle, to occupy the front pages. But the law, now a more conventional Republican talking point than an outsize rallying cry, is still useful to some Republican candidates as a tool to motivate their anti-Obama base. Less clear is whether many Democrats will choose to run on some of the ACA’s most popular provisions, such as its protections for people with pre-existing medical conditions. This was the consensus of an event Tuesday the Kaiser Family Foundation and the Cook Political Report held in Washington about the ACA and the midterm elections; it featured people from both organizations and journalists covering tight Senate races for the Des Moines Register and the Charlotte Observer. Any number of developments, such as the start of the second open-enrollment season this fall, could spark a new round of ACA headlines. But barring the unforeseen, the ACA’s time as a lightning rod is probably over, even if there are occasional storms ahead. As the ACA’s political story diminishes and implementation proceeds across the U.S., disentangling the complex story of the health-care law’s impact becomes both more important and more challenging. The effects of the ACA’s coverage expansions, insurance protections, delivery reforms and regulatory requirements on families, businesses, communities and health-care institutions will vary across the country. People will be affected differently depending on their income, employment circumstances and location. Many reporters have been working in the shadow of the political story, trying all along to tell the human story of the ACA. As they and many Americans know, that’s a lot harder to do.